NEW! - See Jeffrey Stanton’s History of Venice educational site. Also take a look at the Book Store. Jeff is best known for his historic work on Venice, California. He has the largest known collection of antique post cards and vintage photographs of Venice, California during it's turn-of the century heyday. 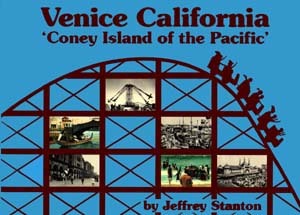 Jeffrey began collection photographs of Venice and its amusement piers in 1978. By 1987 his archive had grown to over 600 quality photographs of pier aerials, the resort’s amusement rides, its parades, canals and business district. Years of reading the Venice Vanguard and Santa Monica Evening Outlook newspapers on microfilm enabled him to write an expanded text rich in the town’s unique history. He concentrated on the town’s amusement zone because it was the economic lifeblood of the town. A new and enlarged edition of a photographic history book has been published about Southern California’s fabulous amusement park that thrilled millions during the first half of the 20th century. Venice and adjoining Ocean Park in their heyday formed the nucleus of a gigantic amusement complex, the Disneyland of its day. Built to look like its namesake in Italy, many of its streets were canaled, its business district building’s colonnaded in Venetian style, and its huge amusement piers contained the latest in fun houses, roller coasters and other thrill rides..
Now after two additional years of research into the motivation and financial aspects of Venice real estate developer, Abbot Kinney’s building of Venice, plus the town’s early history as chronicled in the Los Angeles Times’ news and real estate pages, Stanton wrote a completely revised and expanded text covering the period 1891 to 1912. Fifty six pages and ninety additional photos including construction photos of the canals and pier were added. The result; and outstanding book that showcases Venice’s unique history.